My dearest students, the most brilliant potion brewing masters in the whole world have joined our teaching staff for our new master classes. Some of them have a really playful attitude, I’m sure you’ll have a lot of fun this year! On the other hand, some of them might seem a bit grumpy at first, but I’m sure you won’t be demoralized by a good old scolding… you’ll get to know how they like to get things done. You’ll also learn to brew new potions, and to handle a new kind of Ingredient: Ghost Ectoplasm. Good luck! 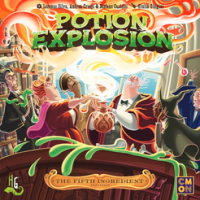 Add a Review for "Potion Explosion: The Fifth Ingredient"